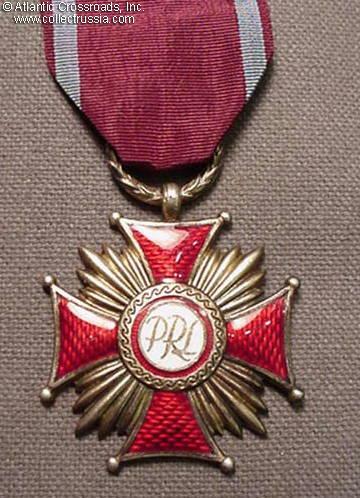 $50.00 Cross of Merit, 2nd cl., "RP" type, circa early 1950s. In fine to very fine condition. $25.00 Cross of Merit, 3rd cl., "RP" with flat reverse, circa 1949- 52. Excellent condition. $20.00 Order of Polonia Restituta, 5th cl., miniature stickpin of fine quality. $25.00 Medal for Victory and Freedom (Zwyciestwo i Wolnost), 1945. A superb example on old ribbon. $35.00 Medal for Oder - Neisse - Baltic Campaign, March - April 1945. In outstanding condition and includes perfectly preserved old ribbon. $15.00 Anniversary of the Peoples Republic of Poland, January 1955 issue. In excellent condition. $15.00 Document for Medal for 30th Anniversary of People's Republic of Poland, 1974. In excellent condition. $50.00 Felix Dzerzhinsky Centenary, commemorative table medal, 1972. German silver, diameter 70 mm. $35.00 Polish Civilian Air Club table medal, 1969 issue.